Lessons From The Last Time Civilization Collapsed : 13.7: Cosmos And Culture Life as we know it is being threatened by everything from climate change to resource depletion. 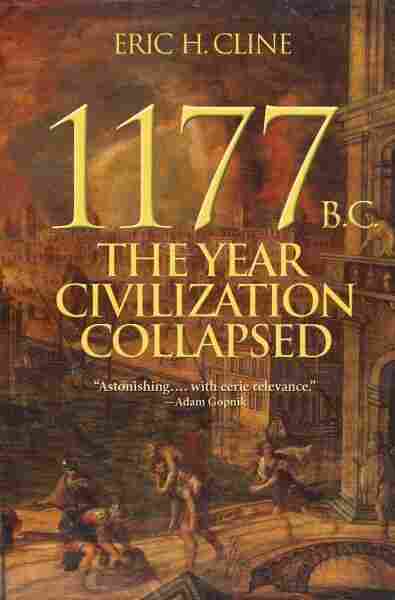 Commentator Adam Frank looks back at 1177 B.C. — and what we might learn from peoples past. 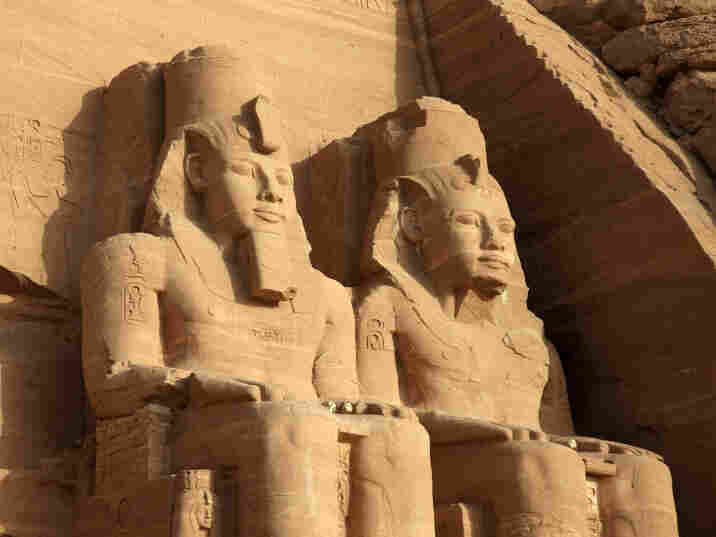 From the Abu Simbel temples in southern Egypt, dating back to the 13th century B.C. Consider this, if you would: a network of far-flung, powerful, high-tech civilizations closely tied by trade and diplomatic embassies; an accelerating threat of climate change and its pressure on food production; a rising wave of displaced populations ready to sweep across and overwhelm developed nations. While that laundry list of impending doom could be aimed at our era, it's actually a description of the world 3,000 years ago. It is humanity's first "global" dark age as described by archaeologist and George Washington University professor Eric H. Cline in his recent book 1177 B.C. : The Year Civilization Collapsed. 1177 B.C. is, for Cline, a milepost. A thousand years before Rome or Christ or Buddha, there existed a powerful array of civilizations in the Near and Middle East that had risen to the height of their glory. Then, fairly suddenly, the great web of interconnected civilizations imploded and disappeared. "The world of the Late Bronze Age and ours today have more similarities than one might expect, particularly in terms of relationships, both at the personal level and at the state level. Thus, they had marriages and divorces, embassies and embargoes, and so on. They also had problems with climate change and security at the international level. These are not necessarily unique to just them and us, but the combination of similar problems (climate change and drought, earthquakes, war, economic problems) at the very same time just might be unique to both." The Late Bronze Age that Cline is interested in stretches from about 1500 B.C. to 1100 B.C. The Bronze Age itself, as opposed to the Stone Age before it, begins somewhere around 3000 B.C. At that point, people developed sophisticated metallurgy techniques allowing them to mix copper and tin into an alloy — bronze — strong enough for serious sword blades and other goods. It is in the Bronze Age that city building, and the sprawling kingdoms they engendered, begins in earnest. Egypt of the pharaohs was a Bronze Age civilization as was the Babylonian empire. It was the transport of copper and tin for bronze that helped establish complex trade networks. Grain and manufactured goods also became part of that transportation web. Alliances between city-states followed. In this way, the Egyptians, Hittites, Canaanites, Cypriots, Minoans, Mycenaeans, Assyrians and Babylonians became the economic powerhouses of the ancient world — what Cline calls the "Group of 8." Together they built the first version of a "global" culture using long-distance economic and military partnerships that required advanced — for its day — technologies. So what took all these cultures down at the same time? The story begins, but does not end, with climate change. The evidence that a prolonged shift in climate was a factor in bringing down the Mediterranean Bronze Age comes from a number of studies, including one published in 2013, showing that cooling sea surface temperatures led to lower rainfall over inland farming areas. Pollen analysis from sea sediments also indicates a fairly rapid transition to a drier climate during this period that includes the Late Bronze Age collapse. What followed were drought, scarcity and desperation. Ancient voices, preserved in stone, tell the human side of the climate change story. A letter from a commercial officer living in the starving, inland city of Emar begs the recipient in his hometown of Ugarit, in northern Syria, to bring aid quickly. "There is famine in your [i.e. our] house; we will all die of hunger. If you do not arrive quickly, we ourselves will die of hunger. You will not see a living soul ..."
And with famine came migration and wars. The scourge of the era was the mysterious "Sea Peoples" who had swept across the region. According to Cline, it is likely that the marauding Sea Peoples came from the western Mediterranean and "were probably fleeing their island homes because of the drought and famine ... moving across the Mediterranean as both refugees and conquerors." The wars took their own toll. "Be on the lookout for the enemy and make yourself very strong!" proclaims a letter to the King of Ugarit near the end. The warning appears to have arrived too late. Another letter tells of the army's humiliation. "The city was sacked. Our food in the threshing floors was burned and the vineyards were also destroyed. Our city is sacked. May you know it! May you know it!" For Cline, climate change — along with the famines and migration it brought — comprised a "perfect storm" of cataclysms that weakened the great Bronze Age "global" culture. But the final blow, the deepest reason for the collapse, may have come from within the very structure of that society. The world of the Egyptians, Assyrians and Babylonians was complex, in the technical meaning of the word. It was a system with many agents and many overlapping connections. That complexity was both a strength and weakness. Cline points to recent research in the study of so-called complex systems that shows how susceptible they can be to cascades of disruption and failure from even small perturbations. Perhaps, Cline says, the Bronze Age societies exhibited the property called "hypercoherence" where interdependencies are so complex that stability becomes ever harder to maintain. "We live in a world that has more similarities to that of the Late Bronze Age than one might suspect, including, as the British archaeologist Susan Sherratt has put it, an 'increasingly homogeneous yet uncontrollable global economy and culture' in which 'political uncertainties on one side of the world can drastically affect the economies of regions thousands of miles away.' "
"We should be aware that no society is invulnerable and that every society in the history of the world has ultimately collapsed. We should also be thankful that we are advanced enough to understand what is happening." But are we advanced enough to do anything with our understanding? Read an excerpt of 1177 B.C.